Darkroot Basin is a Location in Dark Souls and Dark Souls Remastered. A sub-level of Darkroot Garden, it is not essential to explore it for the main quest. It's accessed by going down a steep path near the entrance of the Garden, just past the first Ent. There is no official boss in the area, but there are still a couple of tough enemies to defeat in the Hydra and Golden Crystal Golem. Darkroot Garden Detour - You can access Darkroot Basin by taking a right turn after defeating the first Ent in Darkroot Garden, once you leave the blacksmith. After you take that right turn, you will be at the top of a cliff and have to steer through a fairly narrow pathway. On the way down, you will find a Crystal Lizard; be quick or watch it disappear and miss out on the its valuable drops. On your way down, there is a small platform that you can drop on to, that just so happens to hold the Hunter Set. Turn around to take the path to the left of the last ramp you descended - we'll get back to the misty woods after this. Down this path, there are more ledges to travel down, eventually leading to a Halberd-wielding Black Knight. Continue down past where the Knight was to find the Grass Crest Shield on a dead body located at the area's lowest point. Right beside where you met the Knight, you can access a small tunnel that leads to a bonfire, and if you continue further down the tunnel it will lead you to an elevator that will take you down to the Valley of Drakes. Now head back up and continue on the path towards the misty wooded area; this area comes with a Lake and its very own Hydra. As you approach you'll see a hill on the right that leads up to tower with a locked door that can only be opened with the Watchtower Basement Key. If you have not already killed Havel the Rock in Undead Burg be prepared to battle him once you open the door. Climb to the top of this tower to open up a shortcut between Undead Burg and Darkroot Basin. Head back down to the misty woods. Hard Men - There are four Crystal Golems in here. Try luring them out one at a time with arrows to avoid going too far into the woods. 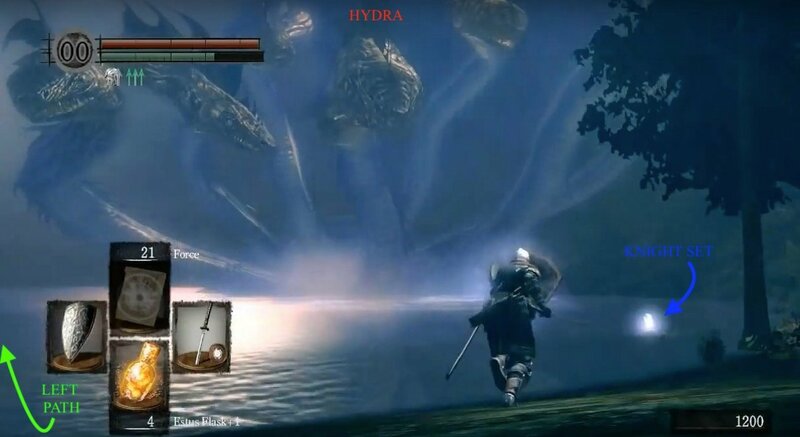 If you go too far in, the Hydra in the lake at the end will start firing water projectiles that inflict large physical damage, if they land. The projectiles can be blocked by a great shield may not block resulting splash that comes from the projectiles, which can occasionally deal decent damage; dodging the projectiles and fighting the Crystal Golems simultaneously is not ideal, so you're better off pulling them away. Sly Fox - Alternatively, if your weapons are ineffective against the Crystal Golems but you have enough movement speed, you can engage them enough so they chase you then manoeuvre around, baiting the water projectiles onto the Crystal Golems, making good use of your environment for cover and cheeky escapes; they seem to only be able to take 1-2 hits from the projectiles before they die, on the first playthrough. Once you have disposed of them, make your way to the Hydra as quickly as possible. For further strategies on the Crystal Golems, visit their page. A Snake With Many Heads - At the lake, you may be tempted to take the fight to the Hydra, but treading too far into the lake will drop you into the Abyss. Avoid this, and stay close to the shoreline, and wait for the Hydra's heads to attack; when they do this, the heads stay on ground level for a couple seconds before winding back up for another attack - take advantage of this and cut their heads off until there aren't anymore to cut off. 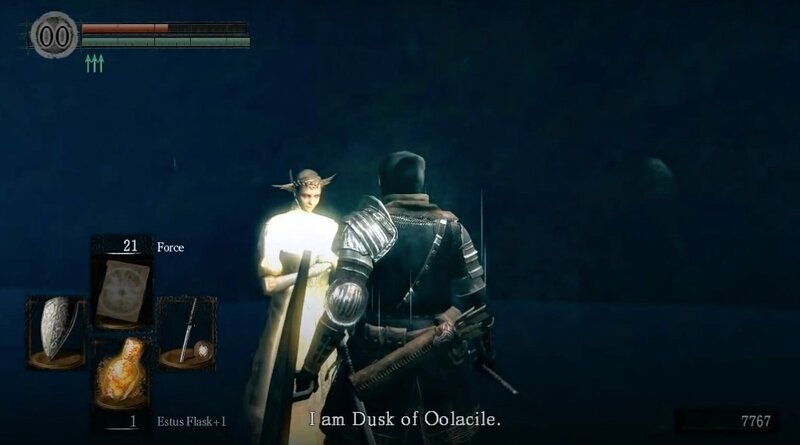 From Dusk Till DLC - Once you defeat it, Dusk of Oolacile will appear in it's place. She will thank you for saving her, give you some backstory and offer her assistance - say 'Yes' to whatever questions she asks. Once done, her summoning sign should now appear next to a rock in front of the lake where you fought the Hydra. Using it you will be able to summon Dusk here where she'll serve as a sorcery trainer, but be sure to only do so without other enemies in the vicinity as she can become collateral damage. If you return to the spot where you fought the Golden Crystal Golem now you will find the Antiquated Set - if not, a cheeky quit-and-reload is in order. (You need to summon Dusk first for the set to appear.) Saving her is also the initial trigger event for accessing the Prepare to Die/DLC Oolacile content. Remember the long ladder beside the waterfall on the left side of the lake? Well a climb up this ladder will bring you to the stone bridge leading to an encounter with the Giant Cats in Darkroot Garden. Once all the above is complete and if you have no further business in Darkroot Garden, the next stop is New Londo Ruins via Firelink Shrine. is it all the same in the prepare to die edition? 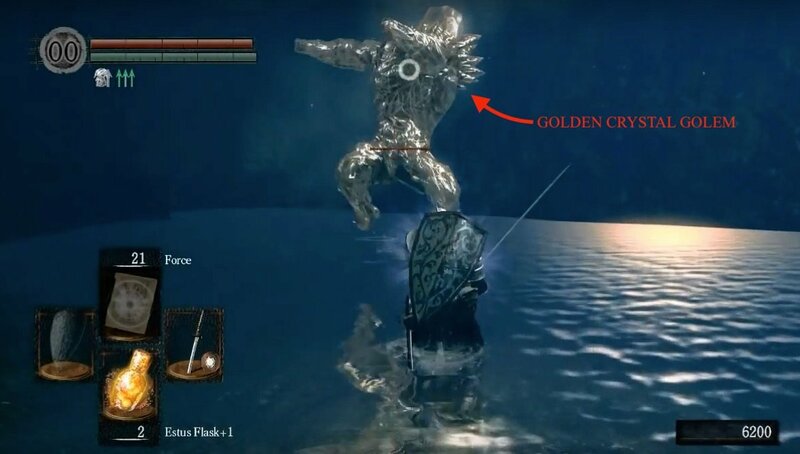 i didnt get to fight the golden goldem after the hydra fight. It is extremely easy to trap the golems here on the left side (the hydra&apos;s right) near the tree and indentation between two ramps up. The wall blocks the hydras blasts, and the golems will continually try and fail to climb up the cliff to you. All 4 can be led here for easy dispatching. 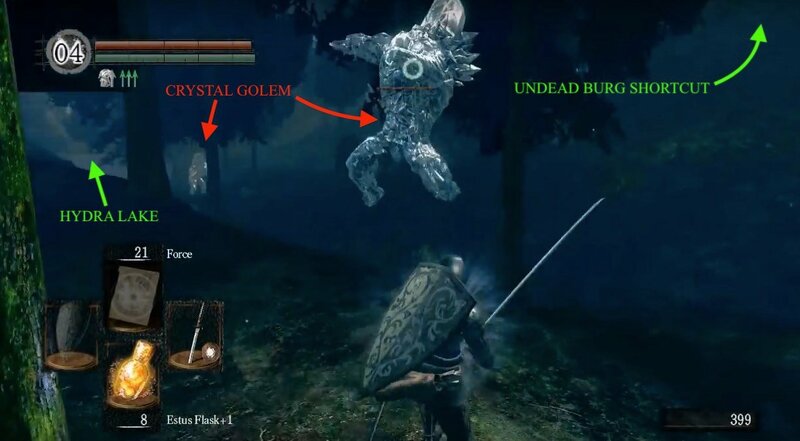 Can you coop here, and what is the boss of the area if so, the moonlight butterfly?